Faster U.K. inflation is putting the Bank of England on track for a rate hike. Eventually. That’s according to the latest Bloomberg News survey of economists, which has 65 percent forecasting that the next move in the benchmark interest rate is more likely to be an increase rather than a cut. But any such move may be some time away, with the median forecast in a separate poll showing no rate change until 2019. BOE policy makers are facing a sharp pickup in consumer-price growth because of the pound’s drop since the Brexit vote, with data next week forecast to show an acceleration to 1.4 percent, the strongest since 2014. That’s just one concern for Governor Mark Carney, who will deliver his first speech of the year on Monday evening, and is keeping a neutral bias on rates as he monitors the potential economic fallout from the decision to quit the European Union. As the pound’s depreciation and higher oil costs feed through to U.K. shops, the BOE expects inflation to breach its 2 percent goal within months. That may make life uncomfortable for policy makers, who are trying to balance the trade-off between supporting the economy and making sure price expectations don’t become dislodged. The inflation data on Tuesday will come hours after Carney speaks on the BOE’s future policy challenges on Monday evening in London. The governor may give his latest thinking on the outlook after the U.K. economy surprised many with a stronger-than-expected performance since the Brexit vote. Carney signaled this week that the BOE could raise its economic forecasts for the second time since the June referendum when it publishes its next policy decision early next month. While sterling and oil are pushing prices up, the pressure may ease if Brexit uncertainty undermines demand and hiring. BOE officials have said that they will tolerate some overshoot of inflation this year to protect jobs and growth, but there are limits to that. Policy maker Michael Saunders said Friday that changes in labor-market structures mean that the U.K. can probably run a lower unemployment rate without fueling too-fast inflation. Like economists, traders also put a higher chance on a rate hike. They are pricing in a 31 percent probability of an increase by the end of 2017, against zero chance of a loosening. 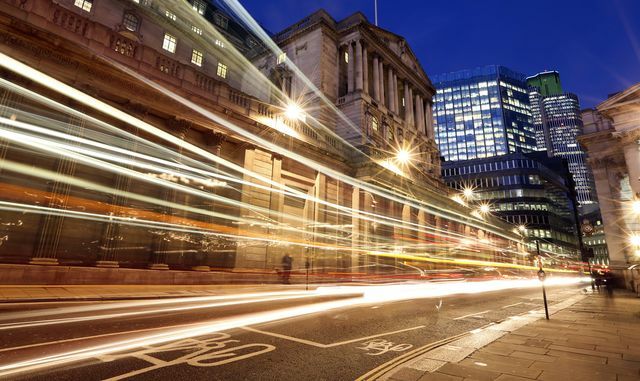 Kallum Pickering, an economist at Berenberg Bank in London, said that while no rate change is the most likely outcome for some time, any change at the BOE leans toward tightening.